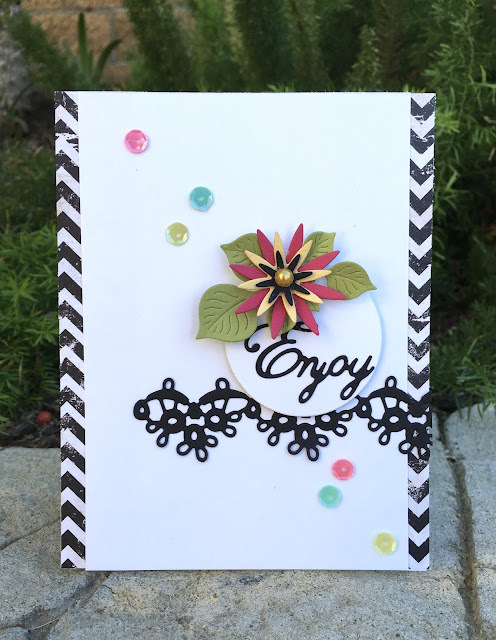 Hi there, today I am here with a sort of a Clean and Simple card using Cheery Lynn Design dies. Well as clean and simple I can create anyway...LOL. I wanted to stretch myself and here are the results of that. 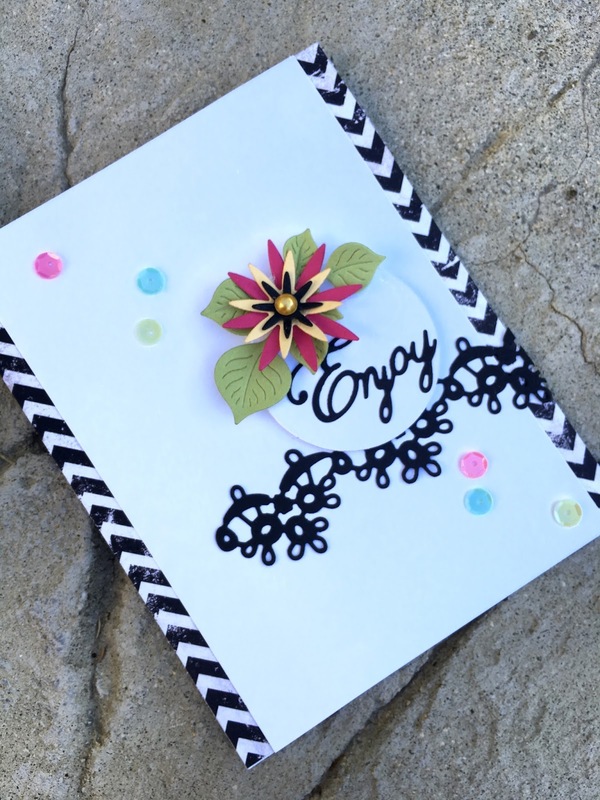 To create my card, I cut an A2 size card base out of a white card stock. Than I took a piece of black and white patterned paper and added them just to the edges and layered another piece of white card stock, so only the edges of the patterned paper showed. Next I die cut the the Dancing Doily Lace Border using black card stock and placed it on my card front just partially. Than I die cut a Circle using white card stock and laid it on top of the lace border. I die cut the Enjoy sentiment out of black card stock to add to my circle. Next I die cut the Chrysanthemum four times using 4 different color card stock and built my happy little flower. I added a gold half pearl in the middle of my flower. Than I die cut Flourish #13 out of green card stock and added it to my flower and placed all of it on top of my circle. As a final touch I added some cute colorful sequins on my card. Thank you for stopping by and hope to see you play along our current challenge.